These babies have changed my life. I have perpetually cold feet. This time of year calls for wool socks and Uggs every day around the house, and cozy boots when I go out. Muck Boots are a country girls best friend but if my socks aren't thick enough, I still get chilled toes. 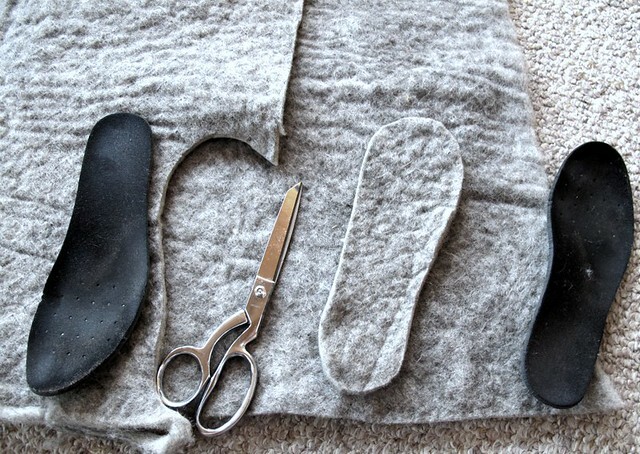 My friend Kate, of Woolen Moss, came to the rescue with her idea to make wool insoles for her winter footwear. * Since I had some of her felt sitting on a shelf, I thought it was high time to put it to use. I pulled out the thin insoles from my Mucks to use as a pattern. I cut a pair out with sharp shears and tried them on in my Uggs, which always get thin on the interior bottom before the rest wears out. Ooooh.... they were nice. It was like having brand new coziness- instantly. I couldn't take them out. So, I made a second pair for my Mucks. Happy feet! Now I need to make them for each member of my family... and everyone I know! See how thick that felt is? If you have a densely felted recycled sweater I'm sure it would work just as well. Give it a try, and let me know how warm and toasty your feet are! *UPDATE: Kate has just listed some ready-made insoles in her shop. Go pay her a visit if you want to purchase a custom pair! 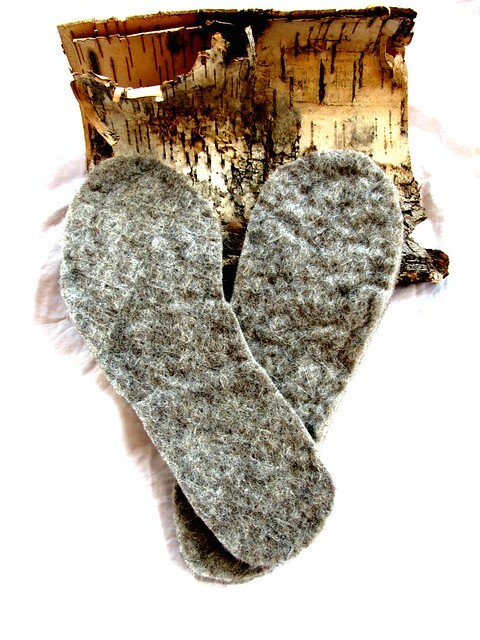 Hurray for warm feet- I make these from my felted sweater stash and even resole my felted slippers with them. Hope you are still enjoying all that outdoor fun! What a simple (and smart) solution! I have a pair of wellies that I have been meaning to knit liners for. I have a feeling it would have been one of those things that I always intended but never got around to. This is so much faster and will make such a difference - thanks! Perfect! I was just thinking about trying to do this for my boots this morning. It's -30C here today, warm wool insoles would have been nice this morning. Brilliant idea, and just what I need to keep my toes toasty. Boy that felt is thick! Great idea! I must find a pair of those Mucks. My feet freeze when I'm outside in my rubber boots. For around the house I wear down filled "slippers" from Mountain Equipment Co-op....they are heavenly! 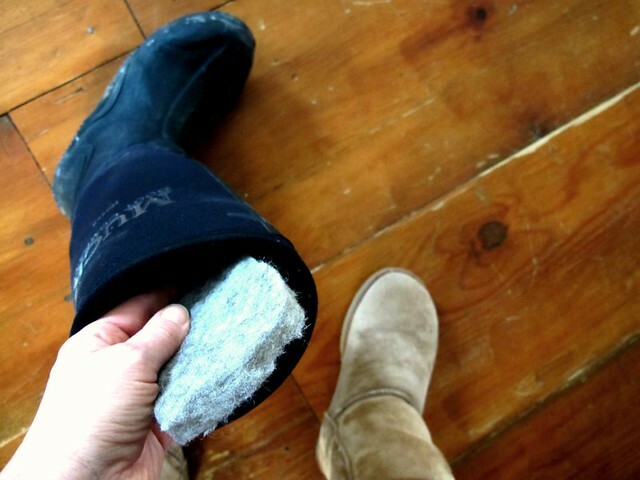 I absolutely love felted wool liners in my boots but I use them as much as I once did. Indiana seems pretty warm compared to Alaska... :) Now if you ever figure out how to make liners for winter crocs I would love to know! I have the worn out liners but am having issues finding the resources locally and affordably. Now I'm off to look at the lovely woolen liners you friend has! Thank you for the reminder! I'm off to make orange felted insoles for my favorite Uggs! Thank you! Brilliant idea. Going home at noon to do pair for myself. Cement floors here in south Dakota are cold. This is a great idea--my feet are always SO cold, even in the super-expensive boots I bought myself from Columbia. I have wool socks, but this extra protection would be great. These look so toasty. My toes get cold so easily. I am excited to try some. Gorgeous dress and lovely fabric choice! Don't be sad about ผลบอล moving to London, think of all the lovely vintage social events you ผลบอลสด can go to. Also London has great fabric shops! so interesting because scholars think this was how felt was first discovered- prehistoric peoples putting fleece in their shoes for warmth and comfort, and finding felt at the end of the day from the agitation of many footsteps. can't wait to try it myself! I will have to try these. I have plenty of wool to knit and felt large squares too. Perfect solution... simple, beautiful, effective. I've been at a loss over what to do about the worn insoles in my boots. I'm going to try this today. You are completely 100% awesome. Love this idea. I made a pair this week for my Bogs out of a thick felted sweater. I have a question though -- are you also using your old insoles or are the felted ones replacing the insoles? I put my insoles back in and put the felted ones on top but sometimes when I put my foot in the felted one bunches up. and am looking forward to toasty toes when attending an outdoor event in two week's time! Looking forward to doing this! I found out I have bone spurs in my feet and the insoles in my boots are worn out from one season! Any ideas on super soft or squishy insoles for tennis shoes when its not for warmth? Question. I can't wait to try this, But... I have arthritis, the autoimmune variety similar to rheumatoid. I need the warmth all the way around my toes. The tips and tops of them can freeze to the point that they won't move. Has anyone figured out how to make something that covers the toes? I'm usually pretty good at coming up with stuff, but nothing seems to work with this. Nancy.... look for Polypropylene sock liners. Or any sock made with polypro. It's the only thing that keeps my feet warm. I had frostbite years ago and my feet get cold quickly. You can find them at Army surplus stores and some outdoors type stores. You could make the insole too long in the toe. Then when you slip your foot into the shoe, the extra bit will curve over the top of your toes. After a few hours of wearing the shoe, the insole would bond to the shoe that way. I love this. now if I can find some. My feet are always cold at work. I work on a raised floor where airconditioning runs underneath. After a few hours it works its way through the bottom of the soles of my shoes. Wool socks don't work for the rest of the day or when I'm walking around the building and stuff. My feet get too hot and sweat and then freeze when I go back to the raised floor. A heads-up on the Muck boots and Uggs. Uggs take four newborn lamb skins to make. Muck boots are made in China. Northerner boots are made in the USA and are terrific waterproof boots. Maggie - shepherd in the wilds of upstate New York. Felt carpet pad works good,too.I padded my Viking Jorvik shoes with It! Now I have a use for the sweaters I don't like or wear!